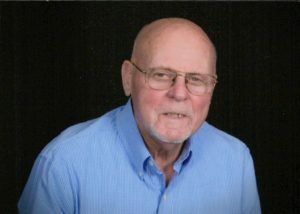 Earl Gordon “Bud” Hatlevig passed away February 2, 2019, at Gundersen Moundview Hospital in Friendship, Wisconsin surrounded by his family. He was born October 23, 1934, to Rudolph and Sena (Thompson) Hatlevig in Rock County. Bud grew up in Evansville, Wisconsin, the youngest of seven children. He attended Evansville schools where he excelled in sports graduating in 1953. After High School, he joined the Army and was stationed in Germany for two years. After returning home, Bud worked for General Motors in Janesville. On August 22, 1959, Bud married Judy Brunsell. They spent the next 59 years together. For 36 years Bud worked at Leath Furniture in Madison. He enjoyed taking care of his lawn and helping Judy garden. Watching and supporting his sons in athletics was important to him. Bud also enjoyed watching the Packers, Brewers, Cubs, and Wisconsin Badgers. Bud and Judy lived in rural Evansville until they retired in 2003. They moved to Friendship where Bud was a member of the Arkdale Trinity Lutheran Church and VFW Post 6279. He is survived by his wife Judy, his children, Terry of Arkdale, WI and Mark (Mary) of Melrose, WI; grandsons: Andrew & Alex Hatlevig; step-grandson, Travis (Jessica) Cook and great-stepgranddaughter, Briar. He is also survived by his sister Martha Myers of Janesville. Also, many nieces, nephews, and relatives. He was preceded in death by his parents, his brothers, Milo, Stanley, Vernon, Ronald, and Rudy. Memorial services with military honors to follow will be held on Sunday, February 17, 2019, at 3:00 p.m. at the VFW Post 6279 in Adams, Wisconsin. Pastor Terri Skildum will officiate. Burial will be held at a later date. Visitation will be held from 1:00 until the time of service. Lunch will be served following the service. Memorials may be given to Arkdale Trinity Lutheran Church or the Alzheimer’s Association. We’re very sorry to hear of the passing of Bud, it was always nice to see and talk with him & his family at the Lincoln Day Dinners over the years, he was a great guy & will be missed, thoughts & prayers go out to his wife & family. I’m so sorry for your loss. Some of my favorite memories are parties we had at your home in Evansville. I haven’t seen you guys much that last few years but you have always been in my thoughts. Take care of each other. My thoughts, prayers and condolences to you and family. I always enjoyed my time with Bud at the VFW and Trinity. He will be missed, Rest In Peace.